I know a lot of regular readers were becoming worried that the offseason SDPI recaps had slowly gone the way of the buffalo. Fear not, SDPI returns! For those who don't know what SDPI is, here is the Reader's Digest synopsis. 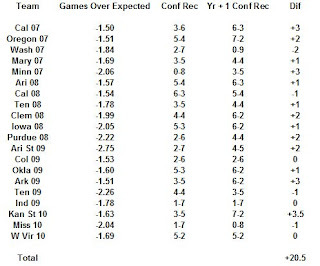 SDPI measures how many standard deviations a team is above or below average at gaining and preventing yards. Since conference play occurs in a vacuum, teams are rated against their conference mates and not against the nation at large. Since there are 11 conferences, you can look forward to 11 posts on how SDPI played out in 2011. We'll begin with the six BCS conferences and tackle those in alphabetical order before moving on to the mid-major leagues. As always, we begin with the ACC. Here's the link to last year's ACC post. This first paragraph will explain how SDPI is calculated. So if you want the meat of this article skip on down. In the 2011 ACC regular season, conference play only, championship games excluded, the average ACC team gained and allowed 3043.75 yards. The standard deviation for yards gained (offense) was 309.47 yards. The standard deviation for yards allowed (defense) was 360.91 yards. NC State gained 2716 yards and allowed 2601 yards. Their offensive SDPI was -1.06 = [(2716-3043.75)/309.47]. Their defensive SDPI was 1.23 = [(3043.75-2601)/360.91]. Their total SDPI was 0.17. This number ranked 8th in the ACC. 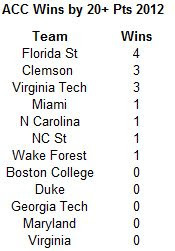 Here are the 2011 ACC standings. Now here are the 2011 ACC SDPI standings. The standings are sorted by division by total SDPI with ranking for each category (out of 12 teams) in parentheses. Clemson and Virginia Tech ended up in a virtual tie atop the SDPI ratings, and lo and behold both teams represented their respective divisions in the ACC Championship Game. Clemson routed the Hokies in Charlotte, winning their first ACC title since 1991. Joining Clemson and Virginia Tech in the upper-tier of the ACC was Florida State. 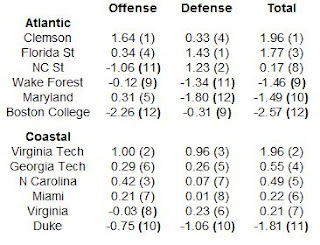 After the Seminoles, five teams (Georgia Tech, North Carolina, Miami, Virginia, and NC State) were within four tenths of a standard deviation of each other. 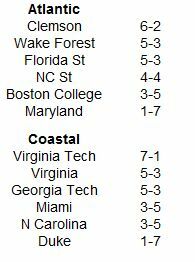 Perhaps not surprisingly, those five teams finished a combined 20-20 in the ACC. Florida State won four conference games by 20 points or more. That was the most of any team in the ACC. However, the Seminoles were not quite as fortunate in close games, losing one-score decisions to Clemson, Wake Forest, and Virginia leaving them with a somewhat deceiving 5-3 conference mark. A few lucky breaks here or there, and perhaps Florida State is playing in the Orange Bowl and not embarrassing the conference. Wake Forest used some Jim Grobe magic (patent pending) and nearly stole the division away from Clemson. Four of the Deacons five league wins came by eight points or fewer. Unfortunately, in the games that were not close, the Deacons ended up on the losing end. In two of their three conference losses, the Deacons were beaten by a combined 46 points by Virginia Tech and North Carolina. Here's what a high school offense can do. The Tigers topped 500 yards in three of their eight conference games after doing so just once from 2007-2010. While Clemson rose (meteorically I might add) from the offensive abyss they occupied in 2010, Boston College dug deeper. The Eagles were held below 300 yards in five of their eight conference games and topped out with a 404 yard effort against Maryland. After opening conference play with consecutive defeats to Clemson and Wake Forest, during which they allowed a combined 834 yards (hardly a terrible amount), the Seminoles put the ACC on lockdown. Their last six league opponents averaged just 282 yards per game. The Temple debacle was a chilling vision of things to come. The Terps, prohibitive favorites against the Owls, allowed 285 yards on the ground and were bludgeoned in their own stadium. In their ACC games. the Terps twice allowed opponents to rush for over 300 yards against them (Clemson and Boston College) and held just two conference opponents under 400 yards (Miami and Georgia Tech). Perhaps not coincidentally, the Terps beat Miami and suffered their closest ACC loss to Georgia Tech. 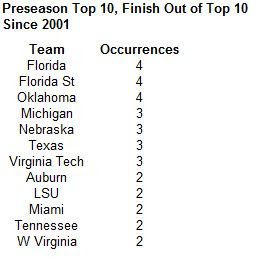 2011 began like many Florida State seasons before it, with the Seminoles ranked in the AP Top-10. Unfortunately, it ended like many Florida State seasons, with the Seminoles ranked outside the AP Top-10. In fact, since 2001 (the year after their last national championship game appearance), Florida State has begun the season in the top-10 and finished outside the top-10 four times, tied for the most nationally with Florida and Oklahoma. The Gators of course, can revel in their two national titles and the Sooners can take solace in their three national championship game appearances since 2001, Florida State has come nowhere near those heights. Florida State may not begin the 2012 season in the top-10, but if they are, this likely represents their best chance to live up to the hype. Last time out, I published a piece examining how extremely lucky or unlucky teams perform the season after they experienced extreme fortune (either good or bad). Now I want to turn to another method that can be used to identify potential sleeper teams and teams that are likely to disappoint their collective fan base. One of the preseason magazines I cannot do without is published by Phil Steele. In the fall, with the television on while on slaving away at this blog, I heard a commercial for a movie starring Hugh Jackman and thought they were making a documentary based on the college football guru. Imagine my disappointment when I discovered it was a derivative boxing movie featuring Rocky + robots. Oh well, I digress. One of the items Mr. Steele harps on in his preseason magazine is how big a role turnovers play in team performance. His magazine always features a section titled 'Turnovers = Turnaround'. Steele's contention is that teams with extreme turnover ratios (either good or bad) will see their margin trend back toward average the following season. 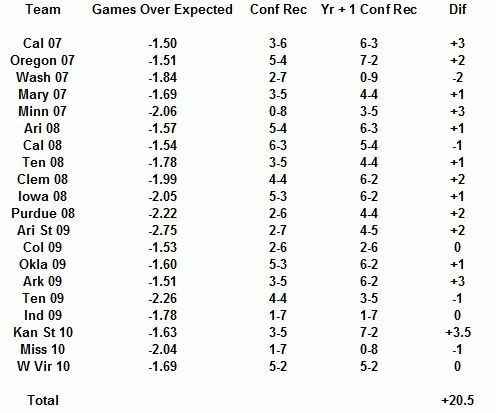 Consequently, teams with great turnover margins tend to see their records decline and teams with poor turnover margins tend to see their records improve. I wanted to test his theory in a similar fashion to the way I tested close game performance. 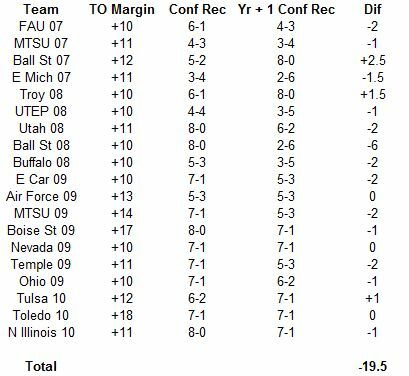 Thus, I looked at every college football team (excluding independents) from 2007-2010 and calculated their turnover margin in conference play. I looked only at conference games because teams often play extremely divergent non-conference schedules. Conference schedule strength on the other hand, remains relatively constant. 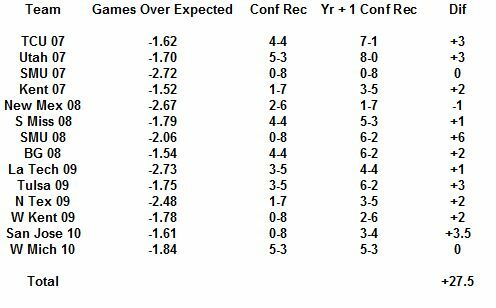 I also decided to differentiate between BCS and non-BCS conferences based on the assumption that the non-BCS conferences would have greater shifts in year-to-year conference record thanks to a much less intrinsic ruling class. I then chose the most 'extreme' teams, those with a turnover margin greater than or equal to +10 or less than or equal to -10, and examined how they performed (in conference) in the season during which they had a great or poor turnover margin. Next I looked at how they performed the following season and calculated the difference. Here are the results. 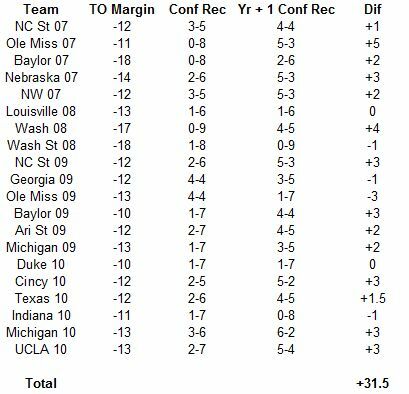 First the BCS conference teams with great turnover margins. Of the 18 BCS conference teams with great turnover margins, 12 (or two thirds) declined by at least one game in conference play the next season. Four stayed the same and two improved. Overall, the teams declined by about 1.2 games in conference play the following season. 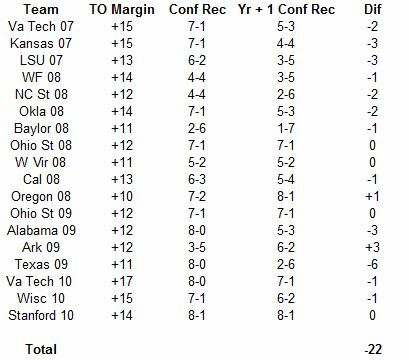 Now the BCS conference teams with poor turnover margins. 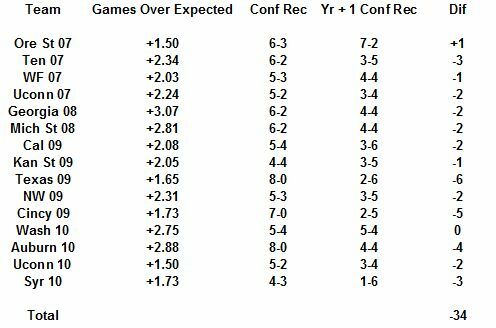 Of the 20 BCS conference teams with poor turnover margins, 14 improved by at least one game in conference play the next season. Two stayed the same and four declined. 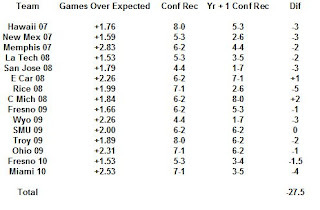 Overall, the teams improved by about 1.6 games in conference play the following season. 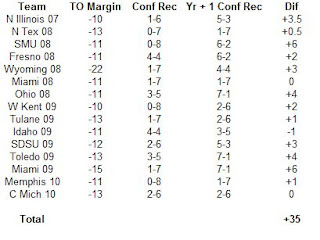 Now the non-BCS conference teams with great turnover margins. Of the 19 non-BCS conference teams with great turnover margins, 13 declined by at least one game in conference play the next season. Three stayed the same and three improved. Overall, the teams declined by just a shade over one game in conference play the following season (-1.026). 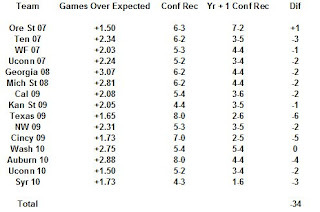 That number is not very far from the 1.2 game decline felt by similar BCS conference teams. 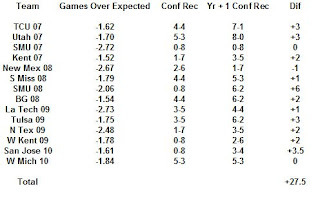 Now the non-BCS conference teams with poor turnover margins. 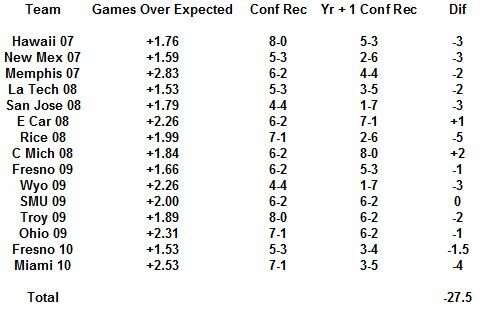 Of the 15 non-BCS conference teams with poor turnover margins, 11 improved by at least one game in conference play the next season. One team improved by half a game, two teams stayed the same, and only one declined. 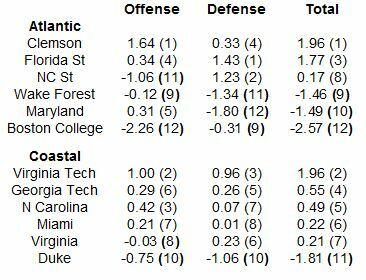 Overall, the teams improved by 2.3 games in conference play the following season. While the decline suffered by BCS and non-BCS conference teams was very similar, the improvement by the non-BCS conference teams is vastly superior (nearly 50% more) to that enjoyed by BCS conference teams. So what teams should we keep an eye on in 2012? Who could be slated for improvement and who may fail to meet preseason expectations? 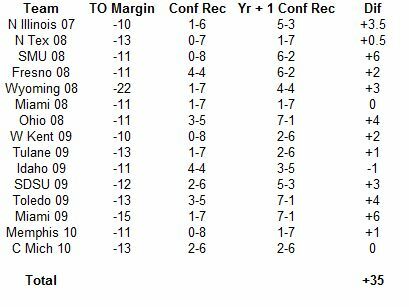 BCS teams with great in-conference turnover margins last season include Oklahoma State (+17), Wisconsin (+13), Kansas State (+13), LSU (+12), and Arizona State (+10). Oklahoma State, Wisconsin, Kansas State, and LSU went a combined 29-5 against their conference foes, so some regression is certainly in order here. Meanwhile, Arizona State went just 4-5 in the Pac-12, so while they do not have as far to fall, they probably will not be contending for the division title either. 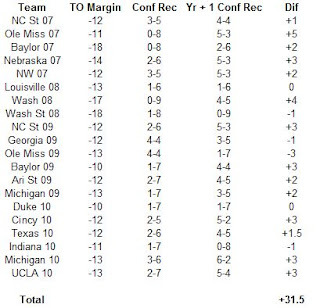 Only two BCS conference teams from last season meet the criteria for poor in-conference turnover margin. Ole Miss (-11) and Illinois (-10) went a combined 2-14 in their respective leagues. Perhaps not coincidentally, they also have new coaches for 2012. At the very least, those new coaches should see at least modest improvement (and they can take all the credit). 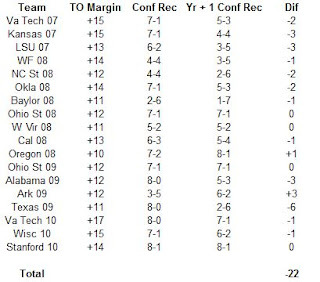 Six non-BCS conference teams had great in-conference turnover margins in 2011. Memphis (+12), Toledo (+12), Houston (+11), Louisiana Tech (+11), Arkansas State (+10), and Wyoming (+10) posted double-digit margins. Four of those teams (Arkansas State, Houston, Louisiana Tech, and Toledo) combined to lose just two conference games. Wyoming also had a solid year in the Mountain West, going 5-2. But Memphis...The Tigers went 1-7 despite a great turnover margin. Arkansas State, Houston, and Toledo all lost their head coaches after their successful seasons so the new hires may be unfairly evaluated if their teams dip somewhat. 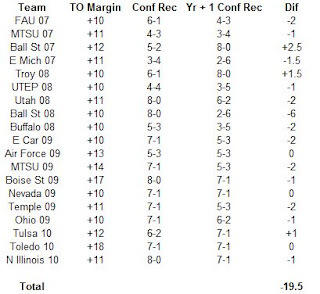 Three non-BCS conference teams had poor in-conference turnover margins in 2011. SMU (-13), East Carolina (-11), and Florida Atlantic (-10) were all bitten by the turnover bug. Amazingly, East Carolina and SMU both finished with at least .500 marks in league play, a sign that they may be contenders in Conference USA in 2012. Meanwhile, the Owls from Florida Atlantic bottomed out at 0-8 in the Sun Belt, so there is no place to go but up for new coach Carl Pelini.